Why Buy Entry Doors From Guida? Our experienced sales consultants will help you design the perfect door for your home by recommending styles and options that will insulate and beautify your entryway. When you buy entry doors from Guida, you're dealing directly with the manufacturer. So, there will be no middle-man! Our entry doors are locally manufactured out of our Boothwyn, PA facility. Our entry doors are constructed to outperform and outlast the typical builder-grade entry doors commonly sold by the big box stores. Our doors are durable, energy efficient, secure, and custom-made to fit your homes specifications. We only hire expert installers of exterior doors that are amongst the best in the industry. Our installers are clean, professional, and respectful to you and your home. Visit our Before & After Photos page to check out our portfolio! Our steel entry doors feature an all-steel utilized construction with composite lock box. There’s no wood inside to rot, bow, or warp like typical wood-edge steel doors. Heavy 22-gauge, hot-dipped galvanized steel is 50% thicker than most steel doors. Fully insulated with an inner core of environmentally friendly polyurethane foam for an R-value of 13.0, which is more than four times that of a wood door. High-strengthed composite top and bottom rails provide protection against water penetration, and engineered not to crack, splinter, rust, warp, rot, or delaminate. Advanced polyurethane foam core for enhanced sound proofing and insulation. Constructed of deep-profile fiberglass reinforced skins with stronger dimensions and crisper shadow lines, replicating the look and texture of real wood doors. Countess options to choose from to customize for your home. All decorative glass lites are hand assembled with different caming finishes and privacy levels. Unique three-frame design is built for high performance against extreme temperatures and is air and water-tight. Clean design free of screw holes and adhesive residue. Offers built-in advantages unmatched in the industry. This feature makes it possible to adjust the door up and down, in or out; giving you a tight fit all the time. We use ball bearing hinges standard on our doors to ensure a smooth, consistent operation for years to come. Easy slide-on door sweep stops air and water penetration, and is not affected by temperature extremes. Wood jamb that features a composite base. Designed and manufactured to withstand time and the elements with a lifetime warranty against rotting and decay. A durable, rigid, UV-resistant PVC bonded to our lifetime warranted Alaska Cypress Dura-Frame Jamb. Available in white vinyl, and pre-finished paint or stained colors. Unique technology option to install entry doors within existing wood jambs. This heavy duty 18-Gauge steel frame provides the highest security rating in the industry. All Guida Steel Doors feature a 22 gauge all steel-edge construction – there are no wood edges which can be cracked when force is applied. This gives you the best security rating in the industry. Receive the beauty of a wood door and the benefits of steel or fiberglass with our stainable textured finishes. All Guida Entry Door Paint finishes are state-of-the-art coatings formulated for maximum durability, UV protection, fade resistance, and lasting beauty. We have many decorative locks to choose from with numerous finishes available to suit your needs. Upgrade your lock to the optional keyless keypad system. Choose from a variety of accessories including mailslots, kickplates, door knockers, etc. Our steel and fiberglass doors can be constructed to accommodate a swinging patio door configuration. 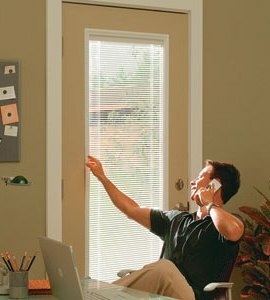 The active door is hinged off the inactive door and swings inward, with an exterior sliding insect screen. A touch of elegance without sacrificing energy efficiency. This 22-gauge steel construction is engineered to give you years of trouble-free service. All steel-edged design guaranteed against splitting, cracking, and warping. The look and feel of real wood, yet with the strength and energy efficiency of steel. Deep grain embossment gives a realistic wood appearance when factory-stained. Contemporary in style. Engineered not to dent, rust, warp, or delaminate. Fiberglass reinforced skins with full length composite stiles and rails protect against water filtration. Stainable rich woodgrain embossment replicates the look and texture of real wood. Realistic graining available in oak appearance. Stronger dimensions and crisper shadow lines. Fiberglass reinforced door skin will not splinter, warp, or rot. Available in four beautiful graining collections including Cherry, Mahogany, Fir, and Oak Grains.